My name is Jane (the boss – hahaha!!) – I like to think of myself as a facilitator as we are all equal. 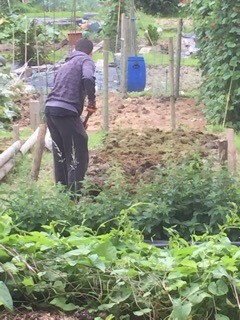 I have a son called Daniel, who doesn’t really like getting his hands dirty, but once down there seems to enjoy himself. Oz, has been given the responsibility of taking over from Geni who helped initially to get us started. Jon – who has recently become a father – used to volunteer for me but has now progressed to paid employment and is my right hand man – you couldn’t find a harder working person. He also runs our disco! 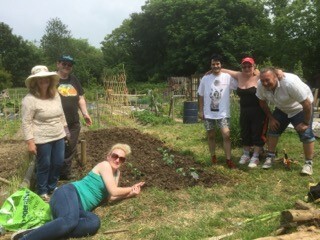 Our members are the lovely Max and Cathy Chatterbox, they make a special trip from Aberystwyth just to water the beds. We also have Tom, who loves the open air and is really keen on gardening. He is sometimes accompanied by his mom Alison, and his brothers Alex and Ben, although Ben is mostly at school. No doubt he will be roped in during the holidays! We also have Lee and Emma, another hard working couple, and Lee is an expert at using and fixing machinery! Our two new faces, Gwyn and Liz, will be joining us shortly, and it will be great to have another pair of hands. 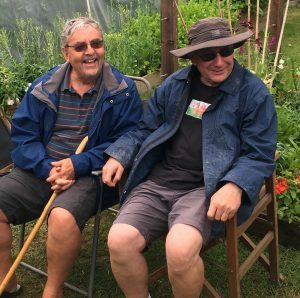 We signed up to the Aberaeron Allotment Association in 2016 and they very kindly waived the fee for us that year. Our members were so excited as it gave them a new challenge and something to look forward to, being able to get out in the summer and have some fun. We were all a bit green (not green fingered), and are still green, we need all the help we can get, but what we lack for in knowledge, we make up for in enthusiasm!! Our space is run by the members of LOVE LIFE PROJECTS cic, which is a community interest company (not for profit). We support vulnerable adults, and our goal is to set up a social enterprise that will generate jobs. 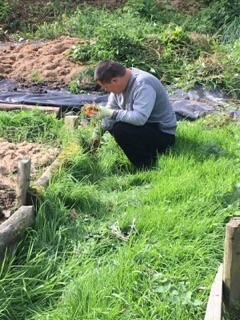 We used the allotment project to train our members, and this year have also started a small gardening service business that has been fairly successful. We started off this year with a lovely lady called Geni Tanner whose knowledge of gardening, what to plant, when, where and how is just amazing. We planted potatoes that are doing really well and some other vegetables that are also coming along nicely. Some of our more recent planting haven’t not grown :(! But we won’t give up. I think next time we plant seeds we will germinate them first, so that they are a bit stronger before putting them into the ground. 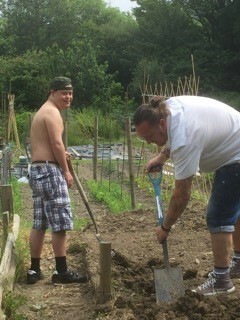 Fridays is normally the day we go down, but some of our members have been enthusiastic enough to go on a Wednesday to water the plots. We probably need to try and get down there most days, even if it is only one or two of us, rather than all of us at once. Something to aspire to! Of course, we are very weather dependent and facilitating a group to coincide with a sunny day is a challenge in itself. We are so proud that you have chosen us to supply the teas for your Open Day this year, and we promise some gastronomic delights (cake) on the day. Perhaps some scones as well. We have a plan to boil the water as well and all our members are looking forward to this event. We are self funded, and only make money from our fund raising efforts or from the jobs we get paid for. As a community interest company, we have the community’s interests to heart, and this year we cleared the area in front of Aberaeron hospital, mowed the grass, cleaned the steps, and generally had a fun day. We did such a good job they have asked us to go back and do their little bit of garden at the back so that the staff have somewhere to sit on their break. 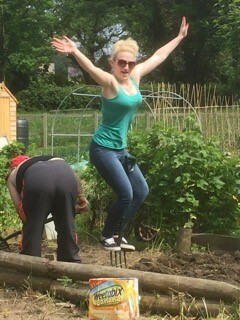 Whilst we are happy for any other allotment members to help us, we are also happy to do our share of any work, such as strimming the paths, rotavating beds etc. Our greenhouse was donated and I am pleased to say the group had the intricate job of putting it together. Feedback was that it was similar to putting together a rubik cube!! I think we are also going to have a shed donated. Feel free to give us any advice you like, we are all happy to learn, and in exchange, we have some strong lads that can keep the paths tidy! Diolch yn fawr iawn.